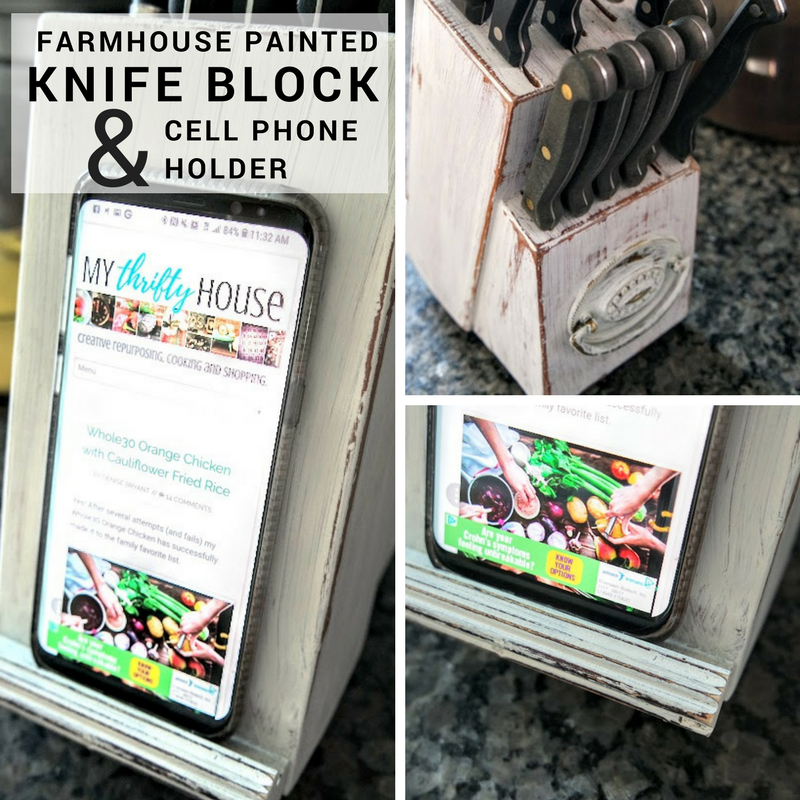 Today the Farmhouse Hens are featuring upcycled thrift store projects and I am so very excited to share this easy DIY painted knife block. Keep reading to see how I updated it with more than just a cute chippy, farmhouse paint job. 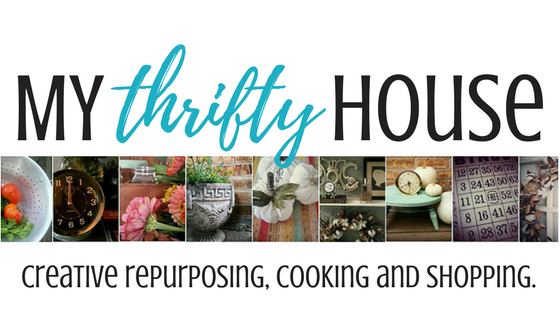 Also, make sure you scroll to the bottom of this post so you can click around and visit the talented Farmhouse Hens and be inspired by their fabulous thrift store projects. I have always enjoyed cooking for my family but my food prep and cooking time have infinitely increased since I started the Whole30 challenge a few years ago. I have completed 4 rounds of the challenge and now I am pretty much eating clean 90% of the time. My clean eating habits have not only increased my time in the kitchen but I have also substantially added to my collection of utensils, dishware and cooking supplies. One day, I noticed that we had a drawer full of kitchen knives that were taking up too much room. Steak knives, paring knives and various sizes of chopping knives. All of them are used on a regular basis so it didn’t make sense to get rid of them. At the thrift store I stumbled upon a shelf full of empty knife blocks and that’s when I had my light bulb moment. I scored a knife block for less than $2 and filled it with the collection of knives that had taken over my kitchen drawer. 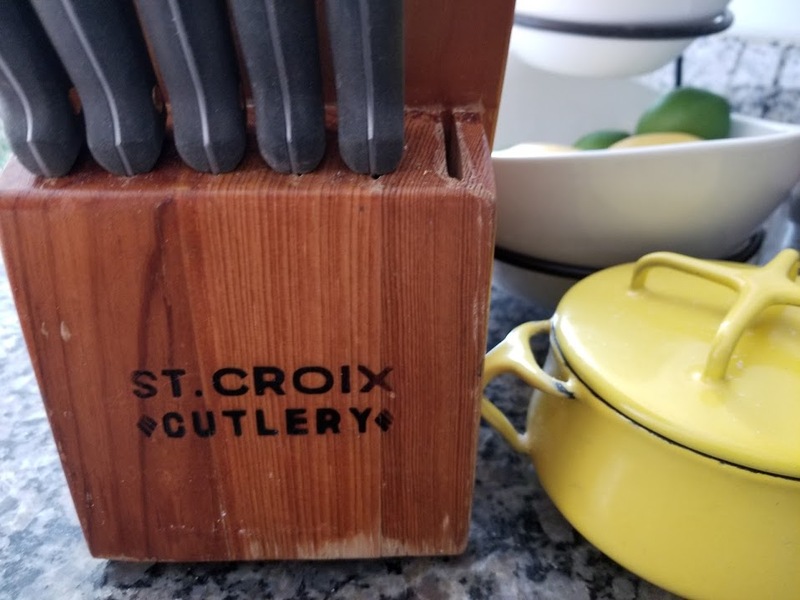 I loved the organization of the knife block and easy accessibility to it on the counter but it was ugly with a huge, brand name logo carved into the front of it. 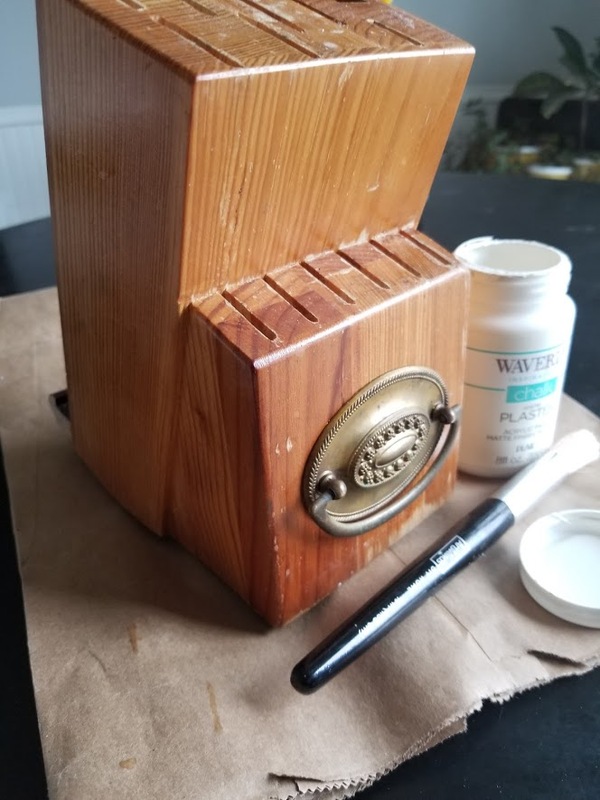 Rather than breaking out the wood filler and sander, I opted to just cover up the logo with a vintage drawer pull from my husband’s stash of random parts. 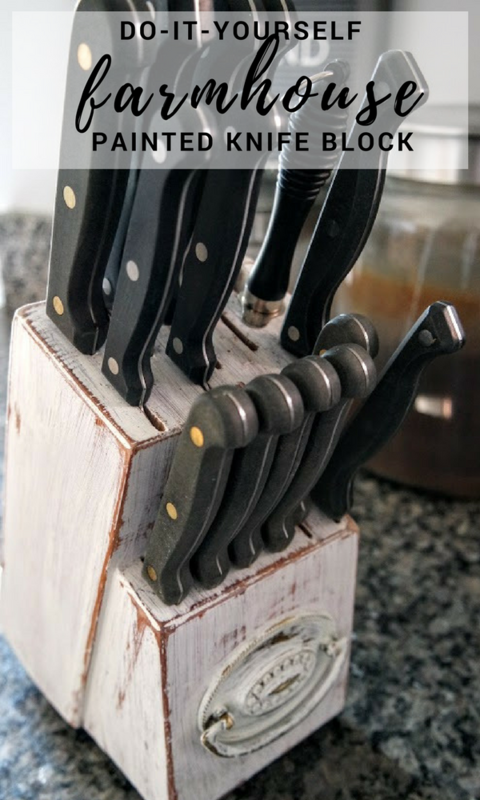 My brilliant husband took this makeover one step further and added a piece of scrap wood from a picture frame to create a small ledge on the back of the painted knife block. 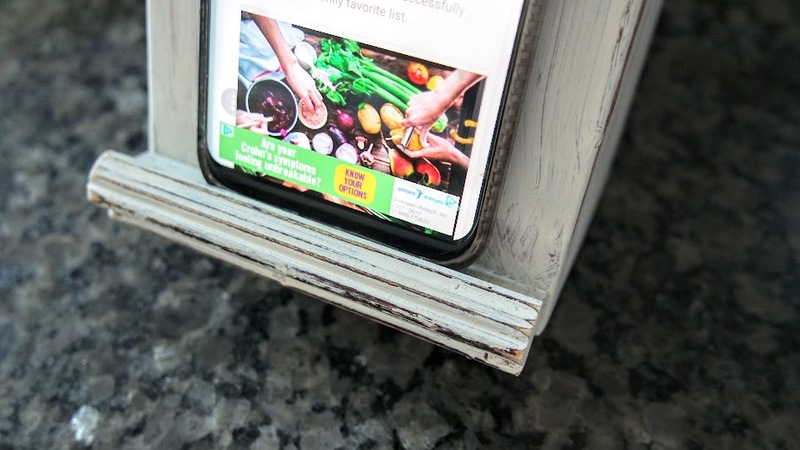 Now I have the perfect place to hold my phone while displaying my recipe or playing music in the kitchen. To make this thrift store upcycle even easier, I opted to paint the entire knife block, including the drawer pull, with one coat of off white chalk paint. Waverly is my “go to” inexpensive, chalk paint when I don’t have the necessary supplies to make my own chalk paint. 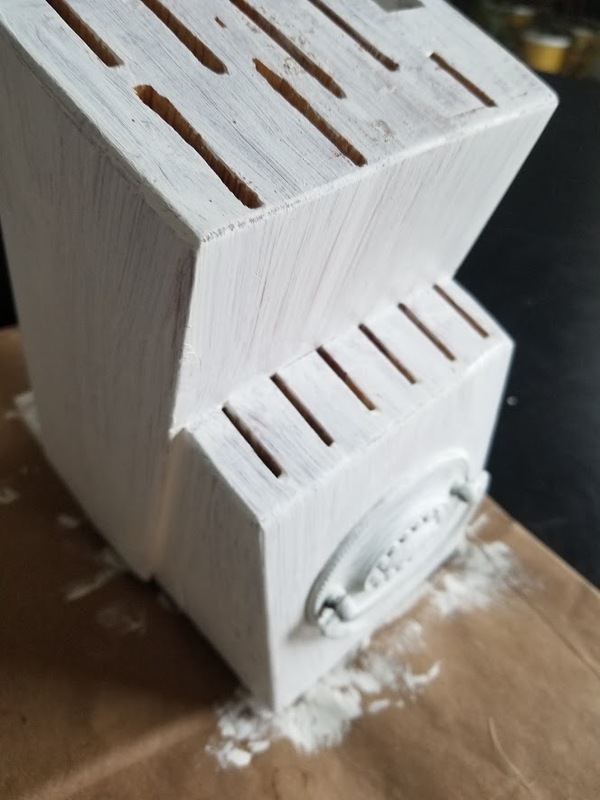 Because I am in impatient crafter I tend to take the quick and easy route with my projects which is why I love chalk paint. You can be sloppy. It dries fast. Brush strokes showing is an added bonus. 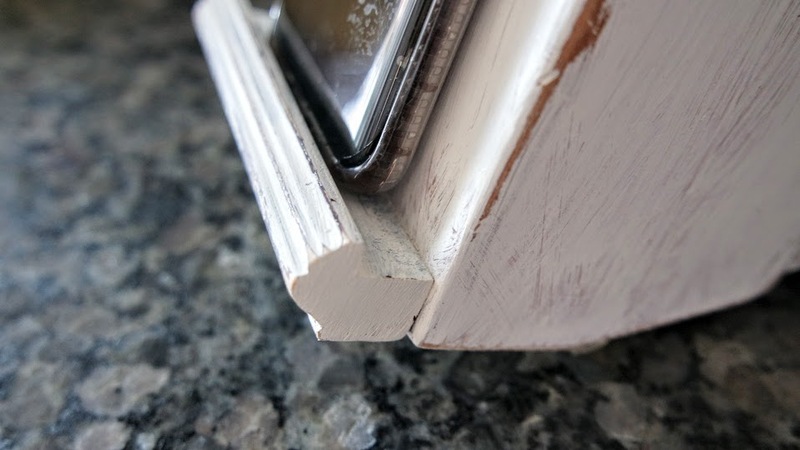 After the chalk paint was thoroughly dry I distressed it with some sand paper and added a coat of clear wax. 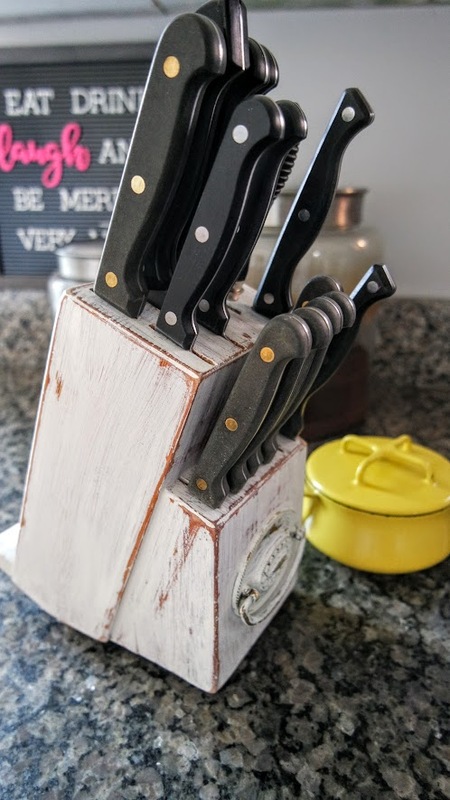 I can’t tell you how much I love this DIY painted knife block. It is functional, it keeps things organized and it looks pretty darn cute too. Thanks Stephanie….functional and cute too. Love it. Denise this is so clever. I want something to hold the iPad or my phone and this is a perfect double use solution. I love this idea. Thanks Leanna…..It would work with an iPad too. The block is definitely heavy enough to hold it. 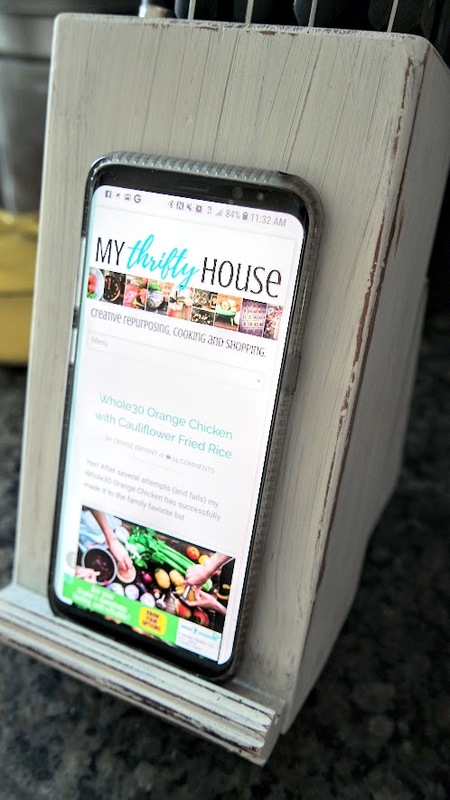 Thanks Sarah….it is so handy when I am cooking in the kitchen and need my phone for a recipe. I love how you turned a simple storage issue into a way to add functional decor to your home. By doing so,you were able to reuse something affordable and solve your problem with a more elegant option. Best of all, you didn’t just plunk down a bunch of money at a retail store which most likely offers workers poor working conditions. Instead,you kept your money in your own community and salvaged an overlooked treasure that might have otherwise helped fill a landfill. I really admire your creativity and thriftiness. Thanks so much for sharing! Much better than letting my phone end up wet on the counter! Thanks! I’m seeing this all over the internet. Great job!!! This is a gorgeous upcycle! So creative!